Life can get you down even when you are living in the tropics! When things are a little tough or quiet it's easy to be miserable about everyone and everything...........and guess what - whether you are on holiday or living here it's sometimes easy to forget just how hard life is for some people around the world. At Antiguanice.com we have decided it's time to start celebrating the people who make a positive difference in our lives by launching 'Antigua Smiles? It's really about who is treating you well, who has given you great service, somebody who no matter how many times you see them, always has a smile for you. There are so many people out there and we want to hear about them from you, 'Who makes YOU smile'? Whatever you take your photos with, when someone really makes your day, ask their permission to let more people know about them, and send your suggestions to us, or post on our Facebook page in our 'Antiguan Smile' album. It's the little things that count, and a smile counts for a lot. AND WHO MAKES ME SMILE? 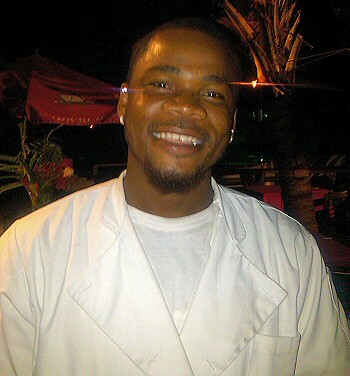 Today's photo is of Josh Vourne who works in the kitchens at the newly opened Galleon Beach Bar and Grill. I don't think I have ever not had a smile from Josh. He works so hard, and for long hours each day, but always takes the time to say hello and send beaming smile my way. Josh is 22 and has big plans for life. He lives in Golden Grove and enjoys a vegetarian diet although he's a demon on the grill! So tell us 'who makes YOU smile'. Upload your photo (with permission) to our Facebook page or email daydre@antiguanice.com and don't forget to tell us why they make you smile.